Navarro Legacy — Navarro Canoe Co. Length: 13' Width: 38" Capacity: 600 lbs. The Navarro Legacy has been very popular with bird watchers, photographers, and anglers. It looks like the traditional canoe an entire generation grew up with because of its re-curved ends and cherry ribs. 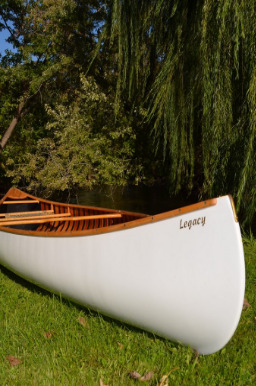 The Legacy offers stability that recreational paddlers appreciate. Richard Combs wrote of the Legacy in Canoe Magazine. "I love this little boat. Navarro's 13 footer is a pleasure to look at and a joy to paddle. The graceful lines of this classic wood and fiberglass design, not to mention the boat's performance represent for me an understated affirmation that canoe building is still more an art than a science." Shipping based on actual charges plus $65 for packaging.